The next morning, Liang Liang drives Qi Yi to work. Even though she rides a bicycle everyday, she’s quite a crazy driver! When someone cut her off, she goes on a high speed chase just to get back at the other driver. When they finally arrive at the office, Qi Yi couldn’t even stand up while getting out of the car! lol. Dean doesn’t waste any time in trying to get close to Liang Liang. He makes an excuse to talk to her then starts blinking at her? Liang Liang thinks there’s something wrong with his eyes so he takes the chance to say he has something in his eye and wants her to look at it for him. When Qi Yi sees this, Dean deliberately gives him a thumbs up. 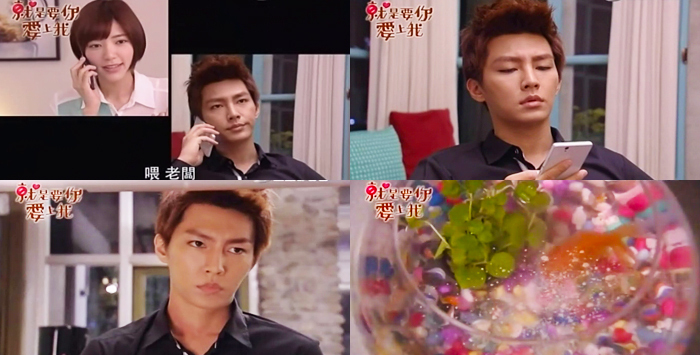 Qi Yi is annoyed and immediately tells Liang Liang to go to his office. They talk about the proposal then Liang Liang leaves. Outside, Dean sees the ‘office romance ban’ on the noticeboard. He’s curious and discusses it with another worker, Shi Cui Xia. She flirts with him (like she does everyone!) and even comments she had Japanese boyfriends before so if he ever wants to improve on his Chinese, he can call her. Inside his office, Qi Yi’s back is itching but since he only has one hand he cannot scratch it. He stands against the cupboard to try to ease the itch but then Liang Liang comes in (without knocking) and wonders what the heck he’s doing? Liang Liang helps him with the itch and Dean overhears their conversation outside. So he decides to come in (without knocking, again!) and Qi Yi is annoyed. Dean asks him about the office romance ban and whether this includes the boss living together with an employee? Flashback to episode 4 when Liang Liang got drunk… after she locked Qi Yi in the balcony, she was walking home when she found this old man trying to push his cart on the road. The cart is stuck so she’s helping him push it out of the pothole. Dean happened to walk by and Liang Liang asked him to help. They pulled the cart out of the pothole and both helped the old man pushed it home. The old man was pushing a cart of recycled things so he asked Liang Liang what he can give her to say thank you. 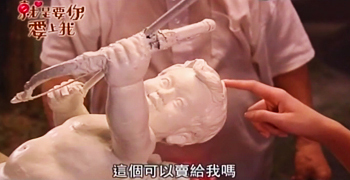 Liang Liang picked the cupid statue, saying that her boss needed it. Dean helped carried the statue to Liang Liang’s house. On the way home in her drunken state, Liang Liang kept complaining about her boss. After Dean took her home he looked inside and realised the house belongs to Qi Yi, and the person Liang Liang had been complaining about is him. Liang Liang is overjoyed she finally found out what happened that night but Qi Yi tells them to cut it out. Dean teases Qi Yi that he’s still so serious. Is it because of what happened in the past? Qi Yi tells Liang Liang to leave the office so Dean and him can talk privately. Qi Yi: I’m warning you, don’t harass my employees. Dean: Unfortunately, you won’t score points if you just defend and not attack. Qi Yi: I don’t know if you watch NBA, but there’s a saying – defend is the best way to attack. Dean: Really? If you attack successfully you’ll be fired. You posted the romance ban. Liang Liang parks the car at the front of the building to wait for Qi Yi. But as she walks to the kerb she accidentally trips and the car keys fell out of her hand and into the sewers. Of course Qi Yi is annoyed at her! At the doctors they bicker, Liang Liang can’t stand how he’s always so picky and harsh while Qi Yi thinks she can’t do anything right. Back at home Qi Yi is sitting on the lounge reading a magazine. He becomes paranoid that the cupid statue is always pointing at him. He tries to move around but can’t shake the feeling the arrow is still pointing at him. He decides to turn his back on the statue. Liang Liang is talking on the phone with her mum. Her parents are fighting again and her mum wants to run away from home. Qi Yi overhears and Liang Liang tells him sometimes she wishes her mum would run away, because their parents’ relationship will be stronger afterwards. She compares this to Qi Yi and his dad, how they will always stick together. In Qi Yi’s office, Kate is outlining the plans she had drawn up for the staff training trip but he is unhappy with her work. She leaves his office disappointed and Alex offers to help her. But she declines, saying it’s her job and she can complete it. Liang Liang also tries to comfort her. Dean sees this and tells them about a consultant he knows of. The consultant can take care of everything. The girls are happy Dean came to the rescue. Shi Cui Xia has a computer issue, another colleague Po Ge (there’s an ongoing sideplot about how he has a crush on her….) was going to fix it for her… but Dean already did. The female employees are all excited about the welcome party they’re holding for Dean, while the men are getting jealous because Dean has all the attention. Qi Yi watches this from his office and is rather displeased as well. On the rooftop, Po Ge is upset that at the age of 40, he’ll probably never find true love. Before the romance ban, he never thought he would fall in love again but now, he likes Shi Cui Xia. 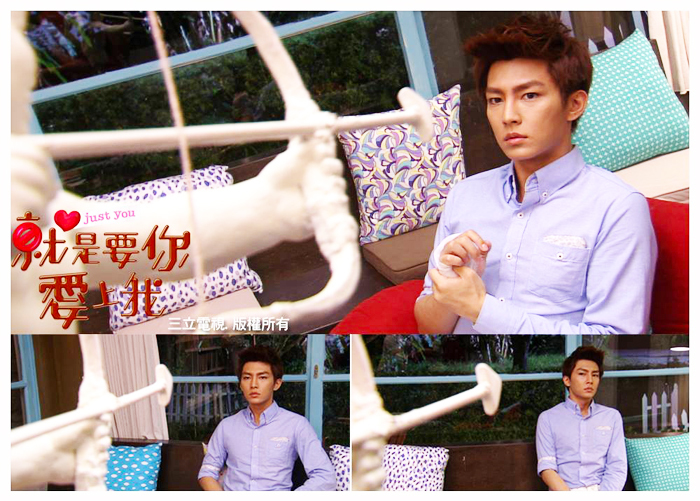 Liang Liang tries to comfort him, saying she will find a way for Qi Yi to lift the romance ban. Liang Liang is happy she found another person in the office who supports her views. Dean’s welcome party is held at the coffee shop and Qi Yi doesn’t go. All the boys are sitting at one table, except Dean, who is sitting with the girls and performing magic for them. The coffee shop owner sees the way Dean is talking to Liang Liang and sends a photo to Qi Yi, telling him if he doesn’t come it’ll be too late. Qi Yi then receives a phone call from Liang Liang, telling him she’s about to head home in half an hour and she will bring him dinner. She also forgot to feed her fish, so she asked him to feed it for her. Qi Yi is still thinking about the photo of Liang Liang and Dean when he took the wrong bottle from the cupboard. He accidentally spilled pepper(?) into the fish bowl. Then he walks away. At the party, they give Dean a gift – a tiger. They talk about which animal represents each person in the office. Then Qi Yi suddenly arrives. He is very happy to meet with the coffee shop owner (Big Brother Buzz)’s niece and nephew. They knew each other for a long time and Qi Yi is hugging them. Liang Liang looks a bit… jealous (?) or just unhappy why Qi Yi’s always so mean to her when he can be so nice to others. Liang Liang and Qi Yi sit down to eat dinner when he sees there’s a grain of rice stuck to her face. She starts imagining him leaning really close to pull the rice away… then put it in his mouth… but back in reality, he just uses his chopsticks. She asks him what he’s going to do tomorrow, since it’s a holiday but he isn’t doing anything exciting, just stay at home. Liang Liang tells him she’s going back to her parents’ place. The next morning, Qi Yi wakes up to breakfast already prepared by Liang Liang before she left. He goes to get some seasoning, but realises… poor goldfish Shan Shan is dead. He calls Big Brother Buzz to get some advice, and immediately rushes over to the pet store to buy a new goldfish! 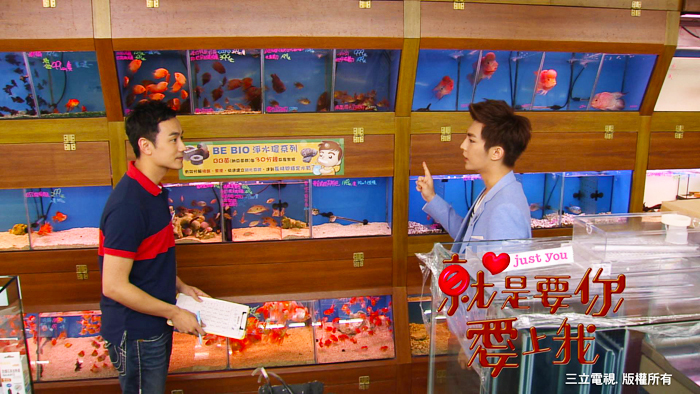 Pet Store Owner (guest star Lin Yo Wei) is back! Qi Yi shows him a photo of Shan Shan and says he wants another fish like it. Lin Yo Wei immediately recognises the fish…. Lin Yo Wei: You can just buy a new fish. Why do you want an exact copy? Qi Yi: Boss… Landlord… I’m her boyfriend, so I don’t want her to be upset. No one ever said “Just You” is very deep and you won’t expect anything groundbreaking. Case on point – in other dramas the ‘turning point’ event that happens to the OTP could be a kidnapping (I’m looking at you “Love Around“!) or someone getting seriously injured… but here, it’s poor Shan Shan who got killed. I’m not saying fishes are not important, just that in the grand scheme of things, and judging on Liang Liang’s reaction, it’s the event that will trigger a ‘turning point’ for our couple. Based on the preview for episode 7 Liang Liang starts packing and wants to move out? Nevertheless I enjoyed this episode and had some good laughs along the way. Qi Yi and his little quirks in particular! There’s a scene in the beginning where he’s annoyed/angry but still he has to readjust the cushion on the sofa because it’s crooked! LOL! I’m also very glad Liang Liang is a lot less annoying in this episode. There is one scene where she has to ‘play cute’ but it wasn’t as overpowering as previous episodes. I also loved the interaction between Qi Yi / Dean, I wonder what happened in their past? Where did you watch episode 6 with english subtitles?